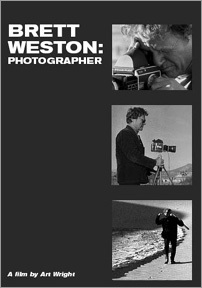 This DVD is a remastered 1972 film which follows Brett Weston on a photographic trip through parts of California and Nevada. It follows the photographic life of one of the masters in our photographic heritage. The film examines Weston's way of seeing, from the act of discovery in the field to the final print on the gallery wall—an integrated statement in black-and-white on a photographer whose medium is the black-and-white silver image. The film is narrated by photographic historian Beaumont Newhall and is thirty minutes long. The DVD includes remastered sound clips from archived tapes of interviews with people close to Brett: Nancy Newhall, Merle Armitage, and Don Ross. There is additional material from Beaumont Newhall and also from Brett. 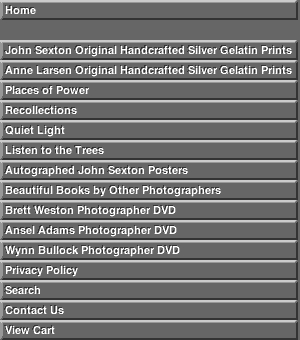 This DVD also includes 892 Brett Weston digitized images which you can scan at your leisure for a good understanding of the range and depth of this amazing photographer. They are used with the permission of The Brett Weston Archive in Oklahoma City. The DVD project is dedicated to the memory of Brett's prodigious body of work. Brett Weston stands among the greats in the history of photography.